Okonomiyaki is a cross between pancake and pizza. “Okonomi” means “as you like”. 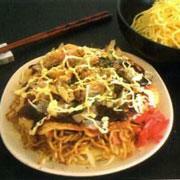 The dish is perhaps so called because it is prepared in different ways in different parts of Japan. This is one of the most popular styles. Place half the fillings (exept for the yakisoba) on top of the pancake.